Aries ~ "The Innovator. Element: Fire. The first sign of the zodiac, Aries is able to make incredible things happen quickly. Hydro-distilled essences of cinnamon, rose, and angelica fuel a vibrant imagination. Frankincense, benzoin, lavender, and sandalwood cool fiery impulses, encouraging the composure needed to realize visionary plans." Taurus ~ "The Sensual Realist. Element: Earth. Ruled by Venus, Taurus is a compassionate sign very resistant to the influence of others. Lush earthy notes of geranium, maté, oakmoss, vetiver, and frankincense encourage flexibility and optimism without compromising shrewdness. Neroli, rose, and grapefruit court the senses and lighten the mood, allowing Taurus to shine even more brightly." Gemini ~ "The Mastermind. Element: Air. Gemini, symbolized by the twins, is an agile thinker with the dazzling ability to see all angles of an issue. This sign is associated with duality, a concept often confused with duplicity—hence the misguided characterization. Charming notes of violet, gardenia, and angelica echo Gemini’s alluring presence and sparkle against a darker backdrop of amber and leather." Cancer ~ "The Levelheaded Bohemian. Element: Water. Cancer is the only sign of the zodiac ruled by the moon. While being adventurous and free spirited, those born under Cancer are known for their cleverness, generosity, and devotion to family. Mandarin, patchouli, and lily of the valley encourage Cancer’s mischievous sense of humor, while sumptuous notes of Tahitian vanilla, amber, and leather make this sign feel right at home." Leo ~ "The Ringleader. Element: Fire. Leo is the only constellation ruled by the sun. Hydro-distilled essences of neroli, bergamot, lemon, and cardamom reinforce Leo’s charisma and inviting style of leadership while smoothing out domineering tendencies. Ambrette seed and jasmine sambac tame Leo’s fire, making gratification come more easily." Virgo ~ "The Exacting Romantic. Element: Earth. Virgo is the guardian of quality, and this sign’s pursuit of excellence is often mistaken for arbitrary perfectionism. Baked earth and palo santo reflect deep introspection and a dedication to nuance. Sparkling notes of neroli, temple mandarin, and rose speak to Virgo’s need for beauty and precision, sweetly quieting the critic." Libra ~ "The Connoisseur. Element: Air. Libra, ruled by Venus, is the most approachable of all air signs, balancing elegance, wit, and mischief with legendary skill. Centering essences of rose, grapefruit, and iris fulfill Libra’s unyielding need for beauty, while golden champa, myrtle, and basil calm Libra's tendency to worry." Scorpio ~ "The Enigma. Element: Water. Scorpio, the dark horse, the infamous rock star of the zodiac, is nothing if not a mystery. Vetiver and palo santo both respect and soften Scorpio’s iron will, while frankincense and cinnamon reflect Scorpio’s deep spiritual wisdom and vast knowledge. Leather and white Cognac encourage Scorpio’s brooding intellect to lighten up and live joyously in the moment." Sagittarius ~ "The Rolling Stone. Element: Fire. The iconic nomad sign, Jupiter-ruled Sagittarius lives for adventure and tends to be a social butterfly. Neroli and lime reflect Sagittarius’s innate optimism, mutability, and fiery ambition. Grounding essences of cypress, bay leaf, and honeycomb encourage this nomadic sign to appreciate present surroundings." Capricorn ~ "The Force to Be Reckoned With. Element: Earth. Ruled by Saturn, Capricorn is famous for a nearly heroic sense of commitment, patience, and drive. Iris, frankincense, and Tahitian vanilla speak to Capricorn’s earthy, sensual side and strong need for stability. Neroli, jasmine, and white Cognac invite Capricorn to let go of routine and enjoy the rewards of spontaneity." Aquarius ~ "The Rebel with a Cause. Element: Air. Aquarius, the third and final air sign, is one of the most charismatic signs of the zodiac. Neroli and rosemary fuel Aquarius’s independence, intellect, and humanitarianism, urging Aquarians to put their global ideals into action. Lavender, white sage, and frankincense soothe anxiety, grounding Aquarius when airy detachment sets in." Pisces ~ "The Dreamer. Element: Water. Empathic and sensitive, Pisces, the twelfth sign of the zodiac, is seen as the wisest and most reflective of all. Grounding essences of frankincense, cedarwood, and black pepper guide Pisces through occasionally stormy seas of emotion. Night-blooming jasmine, kewda, and lime keep the waters of creativity abundantly flowing." 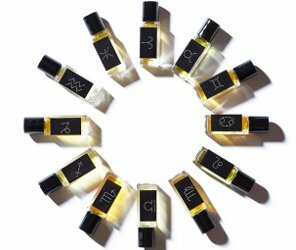 Perfumes of the Zodiac by Strange Invisible Perfumes are $125 each for 15 ml Eau de Parfum. * Some of these scents had been introduced earlier as limited editions, in different packaging. This Taurus is shocked at how picked his favorites notes for the Taurus one. Intersting and will have to get a sample! This Taurus agrees, with only the slightest twinge of apprehension over the grapefruit note; hopefully it’s a background player. Don’t know if it’s coincidence or not, but the three Earth signs’ fragrances are the ones that appeal to me most. Adding to my ‘to sample’ list…. Another Taurus here that likes what she is reading as well. Love oak moss, grapefruit, etc..
Another Taurus here–a little apprehensive about the grapefruit and the geranium. Neither of those is a favorite note of mine. I do not know what mate smells like at all. The other notes do sound good to me. I’m a Pisces and the list of notes for that particular scent look really intriguing, too. A sample set of all twelve would be great since I caught myself thinking of everyone I know in their respective sign and wondering if the scent would suit them or their personality. She’s selling samples for $6 if that helps…would be expensive to get all of them. I went into this lovely shop over a year ago and was there for about two hours! I would up buying Virgo (I am a Virgo but would have bought whatever I liked best) and it is incredible. I’ve not smelled anything else like it ever. The perfumes there are amazing. The sales person was the best. They closed for a long time and finally re-opened. They are right next door to a La Labo on Abbot Kinney in Venice. They discontinued Fire and Cream and I’m still upset about it. Couldn’t afford to buy both at the time. I always visit when I am in California. Fun fact: while I was there that first time, I met three wonderful men on a “Scent Tour” – it was Portia and friends from Australian Perfume Junkies. It was a blast! Oh, did not know F&C was discontinued, what a shame! That was a really pretty scent. I am a happy owner of Fire and Cream, courtesy of a generous NST reader. It’s such a beautiful spicy lavender, can’t believe they discontinued it. I’m sun in Aries, moon in Aries, and Year of the Ram–and the ones I want to try are Libra and Capricorn.